The workplace is evolving as more mobile technology is introduced into the normal way of communicating and handling tasks. 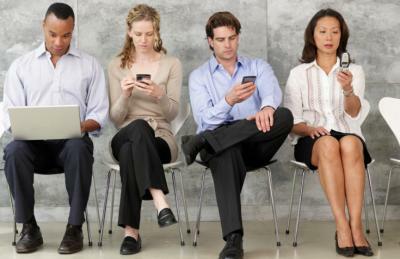 As of the most recent figures from Pew Research, 90 percent of Americans own a mobile device. Smart Insights data reveals use of mobile devices has now surpassed that of computer desktops in terms of finding and using information. It's also important to note that work, as a whole, has been transformed by the mobile device revolution. According to a survey conducted by the International Data Corporation, "U.S. mobile worker population will grow at a steady rate over the next five years, increasing from 96.2 million in 2015 to 105.4 million mobile workers in 2020." That's three-quarters of the American adult workforce that will be working remotely at least part of the time and using their mobile devices to remain productive. These devices are no longer optional for use in work environments, but rather have become a regular practice. Therefore, it's up to companies to create mobile device policies to manage this type of technology and reduce the risk associated with it. From a human resource management standpoint, companies need to establish formal mobile device policies that protect the organization and limit their use to professional purposes. Employees increasingly turn to mobile technology to stay connected to both their personal and professional lives, to communicate with peers, and to collaborate on tasks, but this doesn't negate the fact that any time data is shared outside of the confines of a secure server, it can fall prey to theft. If the mobile devices are owned by the company, then use records are accessible, and employees should be educated they will be monitored anytime they are using a company-provided mobile device to conduct professional and personal tasks. So too, the company will be responsible for providing password-protected networks that are supported by an on-call technical support team 24/7. In a time where mobile devices have become accessible and affordable, many employees are accustomed to using their own mobile equipment to engage in a variety of personal and professional activities while on the company clock. While the use of personal devices for work purposes can and should be discouraged, employers should work this into the written policy. Educate employees they can be personally held liable for sharing sensitive company information. Prohibit mobile devices that allow photography and file sharing in the workplace. Give guidelines for proper use of BYOD for personal use only, not work tasks. From an employer standpoint, there is another reason to discourage the use of mobile devices to stay connected to work outside of regular work hours. Under the Fair Labor Standards Act (FLSA), time using mobile resources to conduct work-related tasks (for example: checking work emails) can be considered compensable work time. Additionally, if an employee racks up any expenses while using his or her personal mobile devices (for example: purchasing mobile Wi-Fi time), then the company may be forced to reimburse for these costs. Fortunately, there are a number of resources and tools available for companies that want to develop a strong mobile device use policy, while protecting the company from any potential harm. US Department of Commerce and the National Institute of Standards and Technology (NIST) shares a free downloadable guide on maintaining security of mobile devices for enterprises. Stay Safe Online provides multiple tips for keeping mobile devices safe and secure at all times, with best practices for companies that provide access to mobile technology. Roboform, a popular product that creates passwords with an app for most types of mobile devices, allows users to keep information locked safely behind hard-to-break passwords. These are just a few ways that your company can manage and control mobile devices in the workplace. Remember that education goes a long way towards maintaining a workplace where information is secure, and employees can maximize productivity with mobile devices.